We periodically see the query, from confused blog owners, in AdSense Help Forum: Blogger / Host Partners, or maybe in Blogger Help Forum: Get Help with an Issue. Why does my blog not show ads, any more? It worked fine, until I changed my blog to my private domain! The blog owner does not know about the rules of Hosted AdSense accounts, vs AdSense for Content. If you start a Blogger blog, you will probably get an AdSense account by using the Blogger dashboard Earnings page, and qualifying the blog. An AdSense account setup under Blogger can only be used with "blogspot.com". An AdSense account setup under Blogger (or other content services) is called a Hosted account. A Hosted AdSense account can only be used with the service under which it was setup. A Blogger Hosted account can be used only with Blogger blogs published to "blogspot.com". If you want to use a custom domain published Blogger blog with AdSense, you need AdSense For Content - a full AdSense account. You can have only one AdSense account. You have to upgrade your Blogger Hosted account, to AdSense for Content, to show ads anywhere other than "blogspot.com". You can only use blogs published to "blogspot.com", with a Blogger Hosted account. To use AdSense outside "blogspot.com", you need Full AdSense For Content. To upgrade to Full AdSense, you need a full domain - ie, a blog published to a custom domain - or a non Google hosted top level domain website. Blogs published to sub domains of a third party service, such as "blogspot.com", do not qualify for AdSense For Content. If you already have your own top level domain website, hosting AdSense for Content ads, then you never setup a Blogger blog using a Hosted account - and you are probably not reading here. You can have only one AdSense account. You need a top level domain website, or a Blogger custom domain published blog, to qualify for AdSense For Content. If you are upgrading your Blogger blog to a custom domain, you need to go through the Hosted to Full upgrade process. This will cause your AdSense ads to stop, for 2 to 4 weeks. Learn the rules - and examine blog content, before you start. Upgrade your Blogger blog, to a properly setup custom domain. Get the custom domain working. Apply for the AdSense account upgrade. Install AdSense for Content ads. You'll want to start the AdSense Upgrade with some expectation of success. AdSense for Content standards are significantly more selective, than Hosted AdSense. Do not start this project, until the blog has an established Hosted Account. Become intimately familiar with eligibility to participate, with program policies, and with prohibited content - before you start. Then, go over the blog - and improve or remove what does not belong. If AdSense is to qualify your blog, under your new domain URL, the domain URL has to work. This requires righteous DNS addresses. Given a properly setup domain, publish the blog to the proper domain URL. Then, redirect the domain root to the published URL. Finally wait, as Blogger completes the domain migration. Once you have a working Blogger blog, successfully using your new non "blogspot.com" URL, start the AdSense upgrade. You will get email from AdSense, instructing you to upgrade your ad content. From the AdSense dashboard, generate the AdSense For Content ads, and install them on the blog. 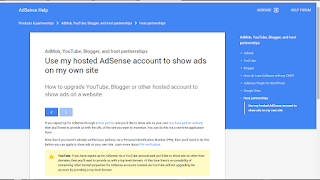 You won't be using the Blogger "AdSense" gadget - that is for Hosted AdSense. You have to get the code for the ads from the AdSense dashboard wizard. When you install the ads, load the code into new "HTML" gadgets - don't edit into the template. Inform AdSense that your new ads are in place. Then wait, as your blog is thoroughly examined. Again, allow 2 to 4 weeks for review. Some #Blogger blog owners publish blogs, with AdSense providing ads in the blogs. Then, they decide to upgrade a blog, to use a custom domain URL. Not everybody knows, before the ads stop appearing, that AdSense for custom domain published blogs is not the same as AdSense for native Blogger blogs.